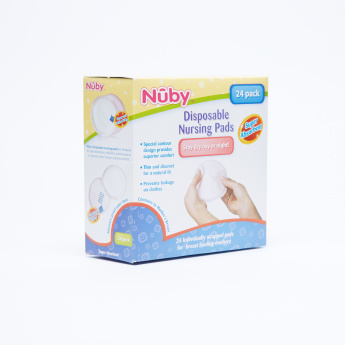 Nuby Disposable Nursing Pad - Set of 24 | Multicolour | Quick absorbant. Use these nursing pads to clean up after feeding your baby. These are extremely soft and sleek in design with super absorbent formula. It comes in a pack of twenty-four that will last you for weeks together. Feature 2 : Comes with soft shape lining and non- slip tape to ensure proper placed. Feature 1 : Quick absorbant.